Bangkok (Thailand) — December 25, 2017 (travelindex.com) — Praya Palazzo, an elegant, 17-room boutique hotel, formerly a private mansion, standing elegantly on the banks of the Chao Phraya River, is offering a romantic and nostalgic dinner for history buffs and authentic Thai cuisine gourmands on New Year’s Eve on Sunday, 31 December 2017. 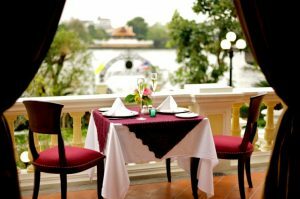 Guests can delight in an al fresco 5-course Thai set dinner ‘with a view’ @Baht 7,000 plus plus or @Baht 8,239 nett per couple, or, a romantic dinner indoors in the hotel’s restaurant Praya Dining amidst classic Thai décor @Baht 5,000 plus plus or @Baht 5,885 nett per couple. For revellers who wish to ring in the New Year in private and outdoors against a unique bygone era setting on the banks of the Chao Phraya River, a nightcap at Praya Palazzo’s Garden is highly recommended: Just drop by the Praya Palazzo Lounge where a friendly staff will immediately arrange for hotel Shuttle Boat pickup to the hotel — from Tha Phra Arthit pier. There, on the lawn of Praya Palazzo partygoers can enjoy a free flow of beverage and canapés @Baht 3,900 plus plus or @Baht 4,590 nett per person from 20.00 hrs – 01.00 hrs. including entertainment by DJ as a modern touch.